This is a guest post from author K.M. Weiland who has recently released instructional CD Conquering Writer’s Block and Summoning Inspiration. Have you ever been sitting at your computer, waiting for all that inspiration in your brain to take shape on the page, only to find that whenever you try to type something out, your internal editor starts choking you up by screaming that you’re breaking “the rules”? You can’t end a sentence with a preposition! You can’t use more than one modifier in a row! You can’t use a whole paragraph to describe the weather! You can’t use dialogue tags like “snickered” and “howled”! If you’re a dedicated writer, you’ve probably already spent a hefty amount of time and money studying your craft. How-to books written by bestselling authors, magazine subscriptions, workshops, classes, software programs—we plunk down our money for them, trusting they will teach us the secrets to writing good fiction. We’re on a mission to learn how to follow “the rules” of writing, because once we’ve mastered them, we’ll be ace writers… right? It’s far too easy to become obsessed with the need to put a little red check beside each and every rule. We stifle our creativity when we try to shackle it within the confines of ironclad conventionality. The whole idea that these rules are even Rules at all is a mistaken notion. Writing, as a form of art, is all about experimentation, innovation, and expansion. Within the confines of standard expectations, you can only expand so much. In truth, there is only one rule of writing: All rules are made to be broken. The rules, as we know them, are really guidelines—techniques that have been proven to resonate with readers over many decades. 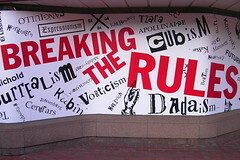 The rules aren’t static; they’re always evolving and redefining what the world considers good literature. What was good in Aristotle’s day wasn’t good in Dickens’s, and what was good in Dickens’s wouldn’t be accepted today. All of art has to bear up under the strange dichotomy of both following set patterns and breaking those patterns. Writing is certainly no different. As writers, it’s our responsibility to learn the rules—to study fiction we enjoy (and hate) and the techniques of authors we admire—and to figure out what works and what doesn’t. Ultimately, that’s the only “rule” that matters. If your sentence sounds better with a preposition on the end, why not write it that way? If that paragraph-long description of the weather is beautiful prose that advances the plot, don’t hesitate to include it. If a descriptive dialogue tag here and there brings clarity to your character’s and tone, there’s no reason not to use it. None of this is to say that, as writers, we haven’t a responsibility to study our craft and apply established techniques to our stories. We can’t expect to flout conventions for no good reason and get away with it. To just throw up your hands and ignore the rules indiscriminately is stupid. To break a rule without knowing you’ve broken it is ignorance. Before you can go around smashing (or even poking at) the esteemed foundations of literature, it’s true that you first have to understand those foundations. But the rules of fiction should never be a prison for our creativity. Instead, the rules should be a launch pad that shoots us off into the wild blue yonder, allowing us to stretch our artistic and creative skills to their limits. K.M. Weiland writes historical and speculative fiction from her home in the sandhills of western Nebraska. She enjoys mentoring other authors through her writing tips, editing services, workshops, and her recently released instructional CD Conquering Writer’s Block and Summoning Inspiration. I love this post. I cannot tell you how often “the rules” had me staring at a blank screen. “The rules,” in my opinion, are one of the most frequent causes of writer’s block. I say break the rules. Shatter them. When you move to the 2nd draft, and you discover that you’ve written a mess or two, THEN fix it if you still feel its necessary. Thanks Corey! and don’t forget you can hire an editor to help you get back into the rules as well. That later draft is so important! Great post. You have to know the rules in order to break them well. Have a read of some China Mieville (who just won the Hugo for best novel!) and see what he thinks of writing rules. Thanks Alan. I did read “The City and the City” and found it a great read, although very dark. He is such a great writer so perhaps one could hide the rule breaking in a fantastic story! Funny, I just wrote a similar post with a little different take. I write YA and see too many new authors ignore the larger rules (too long, main character already out of high school, full of cliches) and then can’t figure out why agents aren’t requesting. I agree that you have to write what you love, but if you want to be published there are some rules you need to follow. At least for the first book. Hi CJ, yes, I agree too. I have just read Stephen King’s ‘Under the Dome’ and wow – he really knows how to use the rules. Amazingly ambitious story with a host of characters but so well done. He is a master though… I am on the bottom rung at the moment! Thanks for having me today, Joanna! The best stories in the world are those written by writers who dare much. Something else I discuss in the CD is the fact that if we’re not writing scared, we’re probably not pushing ourselves to be all we should be. I just got my comments back from the editor on ‘Pentecost’ and I am definitely writing scared! The rules have often done me in–ahhh–and then I tell myself to break a few–it’s ok. Thank you! @Corey: Absolutely! Couldn’t have said it better. If the rules are impeding your creativity, trample them underfoot. There will always be plenty of time to observe them later, if you need to. @CJ: A large measure of any author’s skill (and luck) is the ability to figure out which rules he can break – and which he can’t. @Terri: When the rules start tormenting you, torment them right back! My number one rule: Don’t sweat the small stuff. Just write the book. Fix it later. Definitely. The small stuff can be strained out later during those multiple revisions. Great post! I prefer not to think of rules, but laws of physics. What you do has an effect on the reader – that is all. Hitchcock broke rules all the time with great aplomb. For instance – showing instead of telling involves the reader. So try flipping it around – what effect would you get if you told a scene instead of showing it? Alienation? A deliberate downplaying , which might give it an elegaic quality that the close-up blood-n-guts version would lack? What suits your purposes in the story? It’s good to know rules, of course – precisely so you can experiment with them, be brave and inventive. Fabulous explanation. The “rules” are only techniques that have been proven to work *most* of the time. When they don’t work, they shouldn’t be used. Bottom line. Hi are using WordPress for your blog platform? I’m new to the blog world but I’m trying to get started and set up my own.